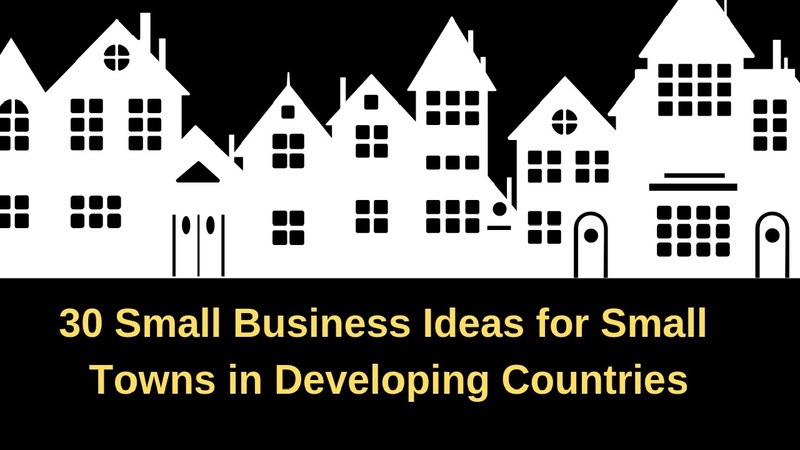 Here are 30 business ideas for small towns in developing countries. You can start these businesses with a small investment. These businesses are easy to start and profitable too. 4. Unavailability of talented human resource. 6. Cultural issues dissuading individuals from entrepreneurship. And there are many more problems faced by entrepreneurs every day in a developing country. All these problems don’t have solutions but the problems never stop dedicated entrepreneurs from working hard to achieve their goals. Developing countries such as Bangladesh, India and Pakistan have a different way of approaching business than developing countries such as Mauritius, Maldives and Nepal. Countries such as Mauritius, Maldives and Nepal focus on businesses which are dependent on tourism. Small towns usually don’t have chain grocery stores as bigger cities. Your store can contain unique products which will make your store stand out from the others which will give you a good profit. Small towns usually don’t have fancy restaurants. If you come up with a fancy restaurant with a reasonable pricing in a small town. It would undoubtedly be a huge success because you are giving people living in a small town a literal taste of the big cities. In addition, your small town might not have quite as much variety in the way of restaurants. So if you have a specialty, like making Indian food for instance, you could start your own restaurant. You could start attracting consumers by delivering food to their doorstep. Start your own delivery service to bring meals to the lazy people out there. Or you could make food on your own and sell them on the streets providing the people passing buy a good and hygienic meal. Flea markets are a good initiative for small town entrepreneurs to sell their goods. You can make your own handmade items or even resell your unused products at your own flea market stand. You could also set up your own shop for handmade goods online. Your hidden talents might flourish unknowingly during this process of making handmade products. Additionally, you can sometimes find great vintage furniture pieces in small towns and then give them new touch and sell them in a higher price. Giving the vintage furniture’s a new life. You can open a pathway for consumers to design their own t-shirt. More like providing them a way to create their dream t-shirts. This business will bring a lot of profit because all the items will be unique. If you have the magic power and patience to sew and alter clothing, you could start your own clothing alterations business and have people send or bring you their items for alteration. If you’re a skilled woodworker, you could start to show your creativity to the world by creating unique pieces. Since small towns often offer lower cost of living and peace they can be great places for independent freelancers. You could start writing for local clients or plying their trade online — to set up shop. So you could start freelancing by writing which would cut down some of your expenses. You could also start your own web design business and offer your services remotely. Or you could provide a variety of different graphic design services for clients, including logos, branding and other elements for the people living anywhere in the world. You could design it for them and deliver it to them online. If there aren’t a lot of shoppers in your area, it might not be a good idea to set up a full retail store. But you could potentially start your own mobile retail store in a small vehicle and then sell items at fairs or events in the area. You can provide bookworms an opportunity to exchange their old books to buy new ones. You can also start bringing books from the cities and sell it in your bookshop to create more attraction from the readers. If wanted you can add a small café with your bookstore where readers can read and also take small bites at the same time. Both knowledge and weight will be gained at the same time. This might especially appeal to those in small towns with a lower standard of living who are willing to make most out of their assets. If your small town offers some beauty or history that could attract tourists, then you could start your own tour guide business to target those consumers. It is a great way to gain general knowledge and also improve your communication skills. For the entrepreneurs who are skilled with automotive repairs and want to get their hands dirty, small towns can be great places to set up a repairing shop especially if there aren’t any other repair shops nearby. If by any chance your town is along the highway this is the best way to provide services and earn money. If you like growing flowers as a hobby you can easily take it as a business idea Sell your flowers in weddings and other events and make money out of it. In rural areas you have a lot of land to yourself why not rent it and earn money. Your extra backyard can be someone’s dream wedding venue. So let their dreams come true and let your pocket become heavier. You could start providing gardening services to your society. It will keep the place clean and also help you make a good amount of money. If you have the wanted skills, you could also start a business where you offer house painting services to local homeowners. You could also start a more handyman business where you provide a variety of different home repair and maintenance services. As rural areas don’t have much IT support and you have the IT brain you could use it as your business. You can charge consumers to support their IT related needs. Small towns and rural areas offer a lot of great scenery that can lend itself to great landscape photography. You can take pictures of it and sell them if you have the majestic photographic skills or you could let other photographers rent your scenery for their shoots. You could also offer your services to local clients as an event planner, especially if your small town has an active business community. You can plan small events such as birthdays to big weddings. You can arrange services for corporates set up their corporate retreats in your small town. If you have beauty skills, you can set up a beauty salon. You can earn a living by making people look beautiful.